Whether you wish to nurture yourself during the winter season or are giddy to dazzle and delight during your warm-weather vacay, the list of services below will have you looking and feeling GLAMOROUS all season long and beyond! Cheers to loving, treating, and pampering ourselves! A Lash Lift + Tint is one of the most popular services at BARE Waxing Boutique. By lifting natural lashes at the root and adding black tint, the appearance of longer, thicker lashes lasts for weeks without any maintenance! 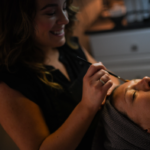 Pair this service with a “Holiday Glow Facial” for the ultimate glam treat this holiday season. Oh hello holiday glow!! Your personalized, natural-looking organic spray tan from Let’s Glow will always be catered to your unique skin type, adding just the right amount of sparkle to your holiday look! Ready? Set? Let’s GLOW! Optimize your health this season by enjoying blissful relaxation at Flote! Treat yourself to a 60-minute massage followed by a 60-minute float for the ultimate experience. Bring along a friend for a slow-paced winter afternoon or gift someone you love with an experience they’ll always remember. 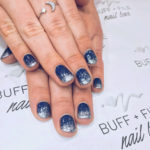 What do we absolutely LOVE about #gelmanis from Buff & File Nail Bar?? First of all, they are beautiful and they last. Even more, the gel dries instantly, which makes it easy to slip right out the door for a night on the town! For a little extra holiday sparkle, go for the (silver or) gold by adding a glitter fade that will shine extra brightly when raising a glass for a winter toast! Cheers! Reveal brighter, smoother, more vibrant skin this holiday season with a corrective peel from Southern Maine Skin Company! Corrective peels help improve the appearance of fine lines and wrinkles while promoting an even skin tone and clear complexion. 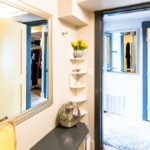 Enjoy this service alongside a variety of others at Lexie’s cozy Kittery studio! 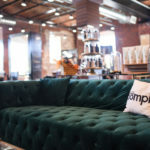 Turn heads when you walk into a room after a blow dry or up-do from Oomph Salon! After a thorough wash, a deep head massage, and some sleek drying techniques, you and your hair will be bouncing all over town! So… It’s possible to LOSE weight during the holidays?? Often told it feels like a hot stone massage, Coastal Aesthetics’ truSculpt body-shaping is the only 15-30 minute treatment that offers 24% permanent body fat reduction! After just one or two sessions, clients see results of fat loss and skin tightening. Complimentary consultations available at Kim’s York, Maine studio! Wondering how to achieve clearer, more beautiful skin?? Experience the HydraFacialMD procedure at Modern Priscilla in York; it combines exfoliation, extraction, and hydration with LED light therapy. This procedure is soothing, moisturizing, non-invasive, and non-irritating, so you can pop from the spa, to party, with ease! How could we forget about our cute little toesies in winter?? Whether you’re hitting the slopes or wearing peep-toed shoes to parties, make sure your toes are looking clean, fresh, and colorful with a pedicure from janegee! 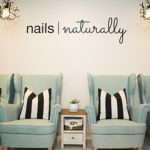 Relax in the cozy Portsmouth nail lounge and enjoy a therapeutic leg massage. P.S. We especially love the Dazzle Dry polish because it truly lasts! 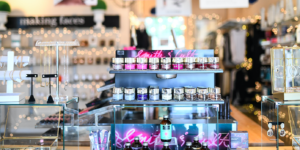 If your skin is in the market for some unparalleled personalized attention, pop on over to Blush Portsmouth for a 30-, 60-, or 90-minute facial that will provide the perfect purifying, detoxifying, and illuminating treatment to bring radiance to your skin! 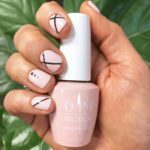 A classic gel manicure infused with CBD could be just the trick this busy holiday season! De-stress and enjoy the therapeutic benefits of a CBD-infused hand massage, combined with a gel mani that has a 10-day chip guarantee! Available at Twenty Local Nail Beautique in Dover. Looking to add a little glow to your holiday look? Select from a full, partial, or head/neck organic spray tan from Blushtan in Hampton, New Hampshire! Create the effect of longer, lifted lashes with “The Lash Lift” from Making Faces! This simple treatment will lift and dye your natural eyelashes from the root, emphasizing the eyes for 6-8 weeks. 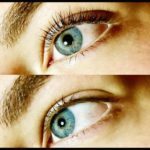 Bye bye mascara! All of the local businesses listed above have a large variety of services to offer, so hop onto their websites to see their full list of services! Here’s to shining bright this holiday season!